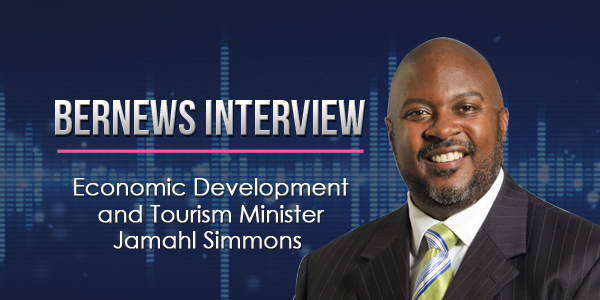 The America’s Cup, the Casino Gaming Amendment Act, the resignation of Alan Dunch, the Bermuda Event Authority, and economic diversification were some of the topics discussed by Economic Development and Tourism Minister Jamahl Simmons as he sat down with Bernews for a live interview on our Facebook page. When asked by guest interviewer Jeremy Deacon, if the recently tabled Casino legislation was prompted as they wanted the Commission Chairman to resign, the Minister said the legislation also deals with the ability to direct the Commission. “Where we’re dealing with the anti-money laundering, anti-terrorist financing issue, when you have a body of that magnitude that needs to be able to get responsiveness from parts of Government, and that were not getting that level of responsiveness, I was not empowered to say could you please provide this information. That flagged something that could be a problem down the road and would need to be addressed,” he said. The Minister said the Bill will stay on the Order Paper until December 8th, and the Cabinet will discuss the matter . Minister Simmons said, “I believe that they should be Independent in terms of Government not being able to interfere with the day-to-day operations, not being able to interfere with the awarding of casino licenses, and most importantly not having the ability to interfere with corruption investigations and criminal investigations, which is what our Act does. “For example, if the NAMLAC Committee requires information, I can ask them to provide the information. They would be required to do so,” he added. “I think the most important aspect of the independence is to prevent corruption. I think that is the most important aspect in anything else. When it comes to things like corruption investigations, when it comes to things of that magnitude, this does not interfere with that. When asked about a perception some may have about having political interference, the Minister said, “The current gaming commission board are political appointees. “They were not appointed by the Governor. They were not appointed by God. They were political appointees. Why are political appointees for one party objective and independent, but yet political appointees for another party are somehow not? “The original commission were political appointees. They were appointed by politicians. As a new Government, remember, this is a policy that was implemented by the former Government, in terms of the direction and vision. “I think part of our mandate was to be more inclusive, more diverse, spread opportunity around,” Minister Simmons said. Speaking on Alan Dunch — the outgoing Chairman of the Casino Gaming Commission — the Minister said, “I want to thank him for his service. “I want to thank him for his time. When you have a change, particularly a monumental change, as we had on July 18th, it is normal and standard and proper that people either submit their resignation or at least work with the Government to transition and make change. “When you have a mandate for change and a mandate to affect change, which is what I told him and the board in our first meeting, changes should be made. I think that it would be proper that political appointees should reflect the fact that there has been a change and provide the opportunity for a new Government to have the opportunity to put people in place. “It is my hope that the person who is announced will calm the waters somewhat,” he added. “We can pick on the OBA if we want, but as a country we did not do a good job of being inclusive, making sure that as many businesses as possible could get in early, even when we look at the programs that were put in place, there are still people struggling to pay back, because they got in late. “They didn’t have an opportunity to really be involved the way they should have. That, I think, is where the Event Authority can really complete the circle, because if I bring an America’s Cup back in five years, let’s say hypothetically, you’ve learned from some logistical challenges. You’ve learned from some of the outreach challenges, but now you also can say okay how can I get more people at the table? “The Ministry of Finance has different numbers than there were in the report, because unlike the America’s Cup, ACBDA, we have to pay for Cross Island, which is 39 million, which was not factored into that number. We are now the ones who are paying the interest on it. “When you look at the numbers in terms of impact, again, 29% of the people who attended were tourists. When you look at the economic impact and reach, people who identified themselves as black only represent 15 or 16% of those who benefited directly. Those are issues that we cannot sweep that under the rug. “If you look at the America’s Cup report, I believe they said only 29% of the ticket buyers were tourists. One of the challenges we faced over the years is the over reliance on Bermudian support of tourism events. “If it’s a tourism event, there is something clearly wrong if we are not going to break even if Bermuda doesn’t support this. We have to move the dial in terms of getting people here, but not just getting people here, but also we have to talk about how, when we draw people here, what are we doing to ensure that they come back? Asked about the Government’s plans for Economic Diversification, Minister Simmons said, “I think you’re seeing bits of it in terms of the tech hub, because that will eventually fall into that. What we envision, supplementing what we already have at the Bermuda Development Agency, is the capacity to create and attract new industries. “I think the Premier in particular is very keen with his tech background to take advantage of all of the new and innovative things that are coming down the line. We’re looking at different structures, looking at the best model, that that is something that is a priority. The text above does not represent the full interview and contains extracts only. For the Minister’s full comments in full context, please watch the video above, or if you want to listen ‘on the go’, you can also access the audio only version of this interview, and all our past interviews, in the podcast section of the Bernews app. Then why are you introducing changes to make the present independent commission little more than a committee of the Minister? This man alone will drive business from our shores. How he came to be in charge of economic development is astounding. Perhaps because he will do as he is told. Convoluted comes to mind but then what else is new? Good Luck Minister, we all need it. First of all his statements are a garbled mess. Likely because the main goal of the bill in it’s present form was to of dispatch Dunch. How watered down will a revised bill be and how many more resignations are ahead? Please do not let it be a major name in the PLP. There are many qualified professionals who are not politically active, appoint one of those individuals. Ask the Accounting Association (CPA, CA, FCA…) or the Legal Association for recommendations and I am sure that they can recommend 10 individuals who would be independent and have a strong moral and ethical background as to undertake this task and put the best interests of the Bermuda first! Better get his passport renewed if he wants to move south. Martha’s Vampire Yard is getting full. Power can make people flip flop. What he really said: “PLP Friends & Family Plan” will kick-in in January 2018 when PLP appoints all their friends to “Govt. Boards” including BEDC, BBDA, BTA, WEDCO, BLDC, RA, Gaming Commission, Immigration, Education, etc., etc..
Stay tuned Bermuda, this is just the beginning of certain behavior !!! I don’t think he would support the Bermuda Rugby Classic either. This minister has failed repeatedly to articulate a convincing argument why Mr. Dunch should go.He has claimed a breech of international rules, and now a failure to respond to NAMLC which I believe is garbage! I was leaning toward supporting the PLP but so disappointed in this Minister’s comments. Don’t think I want to be part of his agenda.